In 1887 Anshe Chesed congregation sold its Eagle Street synagogue building, Cleveland's first synagogue building constructed in 1846, to Congregation B'nai Jeshurun, which left it in 1906, ending the building's life as a synagogue. I found the Cleveland Jewish History website and your history of the Eagle Street Synagogue while doing research on the Lake Shore Electric Railway for my own website www.lakeshorerailmaps.com. The railway had a large freight terminal on Eagle Avenue and I recently discovered that the synagogue had a part in that. Around 1927 the synagogue was converted for use as a freight depot. That use continued to 1932. Not a very dignified use for Cleveland’s first Jewish temple but historical fact nonetheless. I’ve attached two photos which show rail sidings and a small dock on the east side of the synagogue. The sign on the building attached to the west side reads “Lake Shore Electric Ry. System – inbound freight terminal.” I have not been able to find how long the building survived. Some of the freight buildings were demolished in the 1930’s. 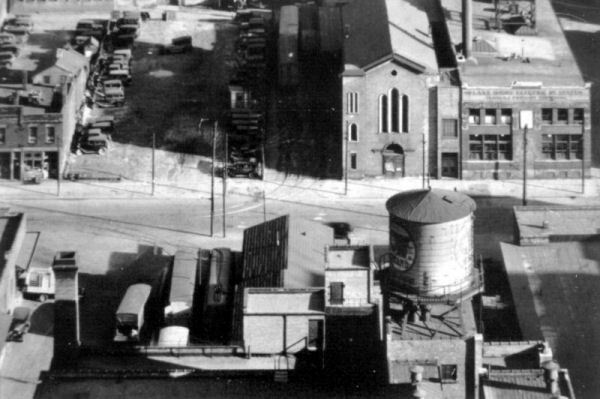 From a 1952 aerial photo we know that the site was then a parking lot and would have been one until 1992 when the construction of Jacobs Field began. .
Drew Penfield had received the photograph from local historian Dennis Lamont. Reform congregation Anshe Chesed, now called Euclid Avenue Temple and led by Rabbi Barnett Bricker was on Euclid Avenue at East 82 Street. Conservative congregation B'nai Jeshurun, now known as Heights Temple and led by Rabbi Abraham Novak, was on Mayfield Road east of Lee Road in Cleveland Heights. If a marker to honor the location of this building on Eagle Street was to be erected today, it would be in center field at Progressive Field.